It's time for a haul post! As you can see I've got a lot of new skincare products to try out, because recently I run out of moisturizers and make up removers. 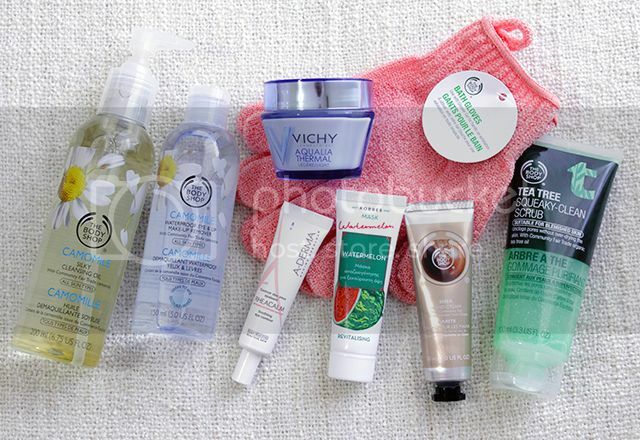 I hauled a few stuff from The Body Shop, mostly because of their sales, and some other from french pharmacy brands. So let's see what I got. The Body Shop Camomile Silky Cleansing Oil: I've read so many good reviews for this baby so when I run out of my Clinique Take The Day Off Cleansing Balm I had to try it out. To be honest I've used it only once and so far I can see that this is very different from the Clinique balm. After I remove it my face doesn't feel dry at all, and the scent is to die for! I have high hopes for this one. 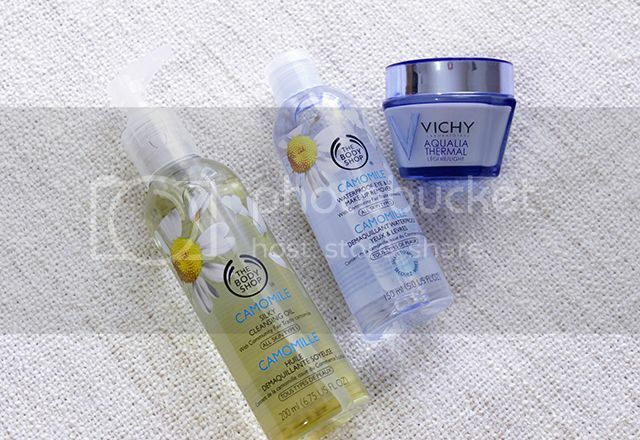 The Body Shop Camomile Waterproof Eye & Lip Make-Up Remover: Also from the same Camomile line I wanted to try this waterprood eye and lip make up remover and see if it's better than the drugstore ones that I'm using. I haven't try it yet so I don't have an opinion on it. The Body Shop Tea Tree Squeaky-Clean Scrub: The last skincare product from The Body Shop that I bought is the scrub from their Tea Tee Line which I've also read really good things about it. My face has been very oily the past few months and I'm in the hunt for products that will help with my ridiculously shiny face. This scrub is very different from the creamy ones that I usually buy, I love the cooling effect it gives after you wash it off and I've noticed that my face look brighter after I use it. Lush's Oceal Salt gave me the exact same results, and that makes me happy! Vichy Aqualia Thermal Light Moisturizer: I got this moisturizer believing that it would be OK for everyday use for my oily skin, but I was wrong. It's definitely not for morning use, especially not under foundation, it makes my face look so shiny after a few minutes and it continues to look shiny throughout the day. I like that it makes my skin look very plump and fresh but I'll keep using it only as a night cream. A-Derma Rheacalm Soothing Eye Cream: To be honest I never thought that I will love this one as much as I do. I used to think that eye creams from the pharmacy weren't that good, that's why I kept buying high end ones, but boy I was wrong! All the eye creams I've tried so far (Clinique, Kiehls, Benefit and more) cannot compare to this baby! It has a very lightweight texture but don't let that fool you, it's super hydrating! If you have dry eye area you really need to try it! Korres Watermelon Revitalizing Face Mask: I used to love the Korres mini face maks and scrubs, especially the Pomegranate scrub, but they've been discontinued for over a year now, so imagine my happiness when I saw that they released new ones! Since I have so many face scrubs and masks already I decided to buy only one (for now! 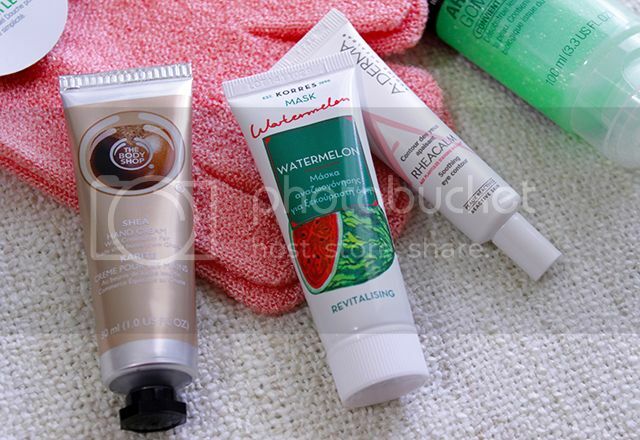 ), so I picked up the Watermelon which is a revitilizing face mask. I haven't try it yet to let you know my opinion about it, but I will soon. The Body Shop Shea Hand Cream: If you don't already know, I'm a huge fan of the Shea line from The Body Shop, and that's the main reason why I bought this hand cream. The texture is amazing, it dries quickly, only after a few seconds and doesn't leave that sticky feeling, which I absolutely hate, on my hands. It's not super moisturizing but it's a great hand cream to carry in your bag. 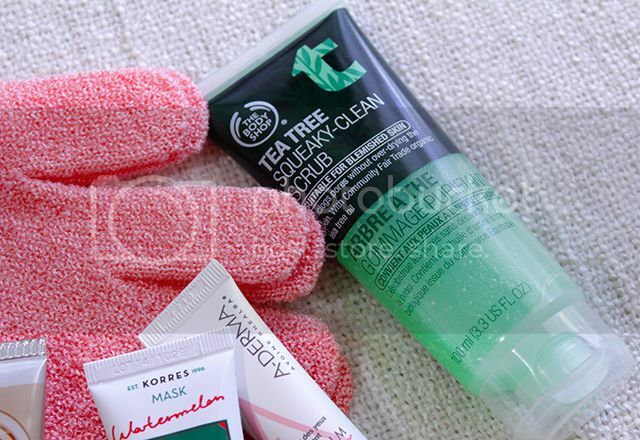 The Body Shop Exfoliating Gloves: These gloves is a huge discovery! I haven't found a body scrub that exfoliates as good as these, and they're so cheap and easy to use! But if you have sensitive skin as I do you have to be carefull, I'm planning to use them only on my legs just because they're not as sensitive as the upper part of my body. Εχεις δικιο, ο ορος θα ηταν καλυτερη λυση! Αν θυμαμαι καλα ειχαν 3 ευρω, αλλα τα πηρα με -30% γι'αυτο κ δεν ειμαι 100% σιγουρη. Με γεια σου, τελειο haul ^_^ πηρα και εγω το λαδακι και τα γαντια τα λατρευω!!! Σ' ευχαριστω!! Αυτα τα γαντια ειναι τρομερη εφευρεση! Τα γάντια για απολέπιση πρέπει κάποια στιγμή να τα δοκιμάσω! Συμφωνώ σε όλα όσα είπες για την κρέμα χεριών των the Body Shop. Να μας κάνεις review για τα προϊόντα ντεμακιγιάζ γιατί έχω διαβάσει κάποιες διφορούμενες κριτικές γι'αυτά. Φιλάκια! Οταν τα δοκιμασω και τα δυο σιγουρα θα κανω!